to work together in the local areas where they live and work, in towns and suburbs all around Nottingham. It is building on the Hope NG9 model of enabling positive relationships between churches and with other community leaders. a national initiative to bring the love of Jesus in word and deed, to cities, towns and villages throughout the UK. 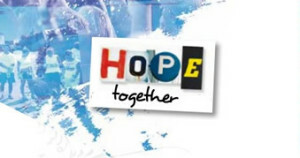 Building on the success of Hope 08, Hope Together is developing a programme of mission for the whole church, from 2016 through to a massive year of Hope in 2018.